The alloy is alloyed with manganese, chromium, Nickel, vanadium, cobalt. Due to the special composition, the alloy has unique physical and chemical properties. It belongs to the group of soft magnetic materials, which explains its speedy magnetic saturability. 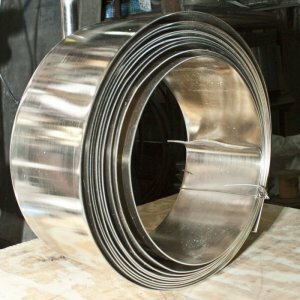 The alloy has a high level of magnetostrictive abilities. Manufacture of electrical equipment, instrumentation, computers, and other devices of high accuracy. The production of modern transformers dimensions of various types. Another area of application is precision engineering, machine tools, manufacture of TV sets and magnetic pipelines operating in a corrosive environment. Also the sheets of this alloy requires manufacturers to produce its sensitive antenna and laser devices. Need such material and metrological sector. The metal during welding does not require special preliminary preparation, although the process must meet certain specifications. You should point out the necessity of preheating the surfaces to 100−120°C With subsequent final heat treatment seams. Buy 49KF from the vendor Electrocentury-steel can wholesale or retail. On the website reflected the price and mix of products to date. All products are certified and meet the highest standards. Excellent product quality and reasonable price — face provider Electrocentury-steel. Regular customers can buy a sheet, using a discount system of discounts from the company Electrocentury-steel. Delivery is carried out from warehouses located in Russia and Ukraine.